Boyz II Men are an American R&B vocal group, best known for emotional ballads and a cappella harmonies. Formerly a quartet featuring Michael McCary, they are currently a trio composed of baritone Nathan Morris alongside tenors Wanya Morris and Shawn Stockman. During the 1990s, Boyz II Men found fame on Motown Records as a quartet. McCary left the group in 2003 due to health issues. During the 1990s, Boyz II Men gained international success. This began with the release of the number one single “End of the Road” in 1992, which reached the top of charts worldwide. “End of the Road” would set a new record for longevity, staying at number one on the Billboard Hot 100 for thirteen weeks, breaking the decades-old record held by Elvis Presley. Boyz II Men proceeded to break this record with the subsequent releases of “I’ll Make Love to You” and “One Sweet Day” (with Mariah Carey), which, at fourteen and sixteen weeks respectively, each set new records for the total number of weeks at number one. “I’ll Make Love to You” also topped the charts in Australia and garnered international success. 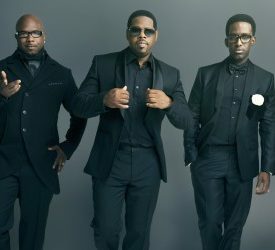 Consequently, Boyz II Men are top ranking members with regard to time spent at number one in Billboard history, currently (as of 2014) at the number one, three, and four spots. Furthermore, when “On Bended Knee” took the number 1 spot away from “I’ll Make Love to You”, Boyz II Men became only the third artists ever (after The Beatles and Presley) to replace themselves at the top of the Billboard Hot 100. 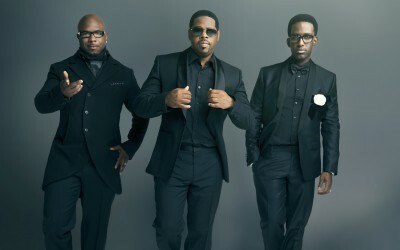 Boyz II Men are among a select group of artists that have held at the number-one spot for at least 50 weeks cumulatively, placing them just fourth on that list behind Elvis Presley, The Beatles, and Mariah Carey. These achievements were enough to earn Boyz II Men recognition as Billboard magazine’s fourth most successful musical group of the 1990s. Boyz II Men continue to perform worldwide, as a trio. On January 22, 2013, the group appeared on The View along with New Kids on the Block and 98 Degrees to announce their joint tour that will take place in summer 2013. Their eleventh album, titled Collide, was released on October 21, 2014.